The Vinaya (a word in Pali as well as in Sanskrit, with literal meaning ‘discipline’) is the textual framework for the Buddhist monastic community, or sangha. The teachings of the Buddha, or Buddhadharma can be divided into two broad categories: ‘Dharma‘ or doctrine, and ‘Vinaya’, or discipline. Generally speaking the former is concerned with theory, and the latter with practice, although there is actually considerable cross-over between the two. Another term for Buddhism is dharmavinaya. At the heart of the Vinaya is a set of rules known as Patimokkha (Pali), or Pratimoksha (Sanskrit). The Vinaya was orally passed down from the Buddha to his disciples. Eventually, three different Vinayas arose in Buddhism, based upon geographical/cultural differences and the different Buddhist schools that developed. The essence of the Vinayas are the same and have only minor differences. Buddhists in Burma, Cambodia, Sri Lanka, and Thailand follow the Theravadin Vinaya, which has 227 rules for the bhikkhus (male monastics)and 311 for the bhikkhunis (female monastics). Buddhists in China, parts of Japan, and Korea follow the Dharmaguptaka Vinaya, which has 250 rules for the bhikkhus and 348 rules for the bhikkhunis. Buddhists in Tibet and part of Japan follow the Mūlasarvāstivāda Vinaya, which has 253 rules for the bhikkhus and 364 rules for bhikkhunis. Surrounding the rules is a range of texts. Some of these explain the origins of the rules — it is possible to trace the development of the rules from responses to specific situations or actions to a general codification. There is also a number of sutta-like texts which are more general statements about Buddhist doctrine, or which give biographical details of some of the great disciples and their enlightenment. Other sections detail how the rules are to be applied, how breaches are to be dealt with, and how disputes amongst the monks are handled. It seems that initially these were quite flexible and were adapted to the situation. By the time of the Buddha’s death there would have been a body of rules which bhikkhus were expected to follow. 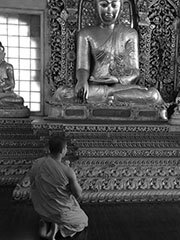 In the Mahaparinibbana Sutta the Buddha, as part of his last teaching, tells the bhikkhus that they can abandon some minor rules, but that they should stick to the major ones, but there appears to have been some confusion over which was which. It was therefore decided that they would keep all of the rules. Immediately after the Buddha’s death there was a council at which all of the teachings were recited, collected and sorted. Legend has it that the huge volume of teachings was recited from memory, with Ananda reciting the suttas and Upali reciting the Vinaya.